junior synonym bucculenta (Cataglyphis bicolor F. stirps saharae Sants. v. bucculenta n. var., Santschi, 1929b: 48, workers) Morocco, Bou Denib, Th閞y - see http://www.antweb.org/specimenImages.do?code=casent0912228. Santschi's (1929b) description of the type and bucculenta is at . Cagniant (2009: 51) stated he had examined the Santschi types and obtusely appears to suggest it and fresh specimens he had collected were simply Cataglyphis bicolor. Collingwood's (1985) separation of specimens from Saudi Arabia as Cataglyphis saharae may be questionable. My conclusion is that the true Cataglyphis bicolor is much lighter orange red and does not have the same line of strong setae on the under margin of the hind tibiae. 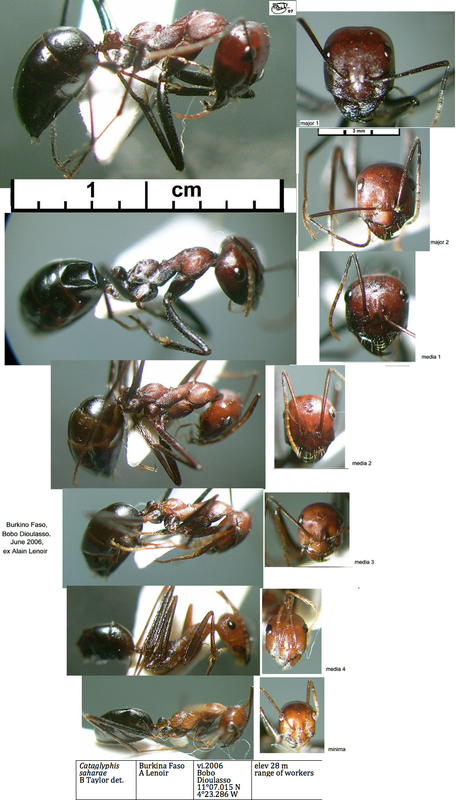 The photomontage of the type major worker is collated from http://www.antweb.org/specimen.do?name=casent0912226. The bucculenta major appears almost identical. 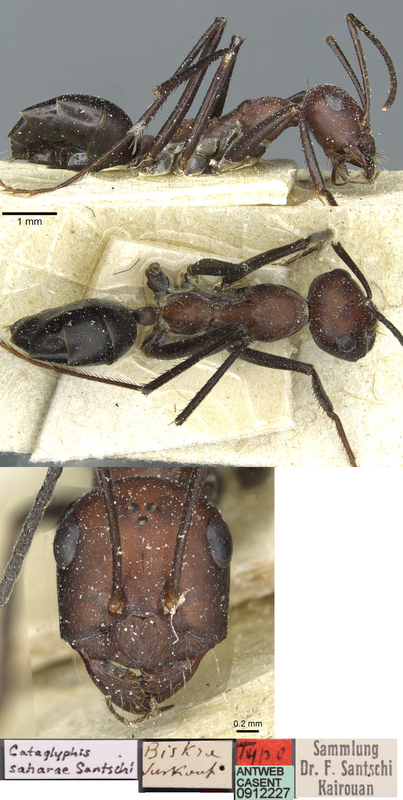 The photomontage of the type minor worker is collated from http://www.antweb.org/specimen.do?name=casent0912227. The following description I compiled in 2007 and thought could be a new species Cataglyphis lenoiri Taylor now (July 2004) cab be seen as C. saharae. The circum-Sahara distribution also now seems not uncommon and I have similarly identified several species from other genera. Location Burkino Faso, Bobo Dioulasso, 11�'N 4�W, ex Alain Lenoir; range of workers from largest to smallest seen. In bicolor species-group of Agosti (1990). Agosti (1990) had a separation that, posssibly, was - petiole nodiform; gaster raised in locomotion (guessed); petiole anterodorsal domed, in lateral view whole dorsum of petiole rounded, propodeum not raised, EI < 28, CI < 97; bicolor-group - striking monophasic variation in workers with AL from < 5 mm to < 2mm. 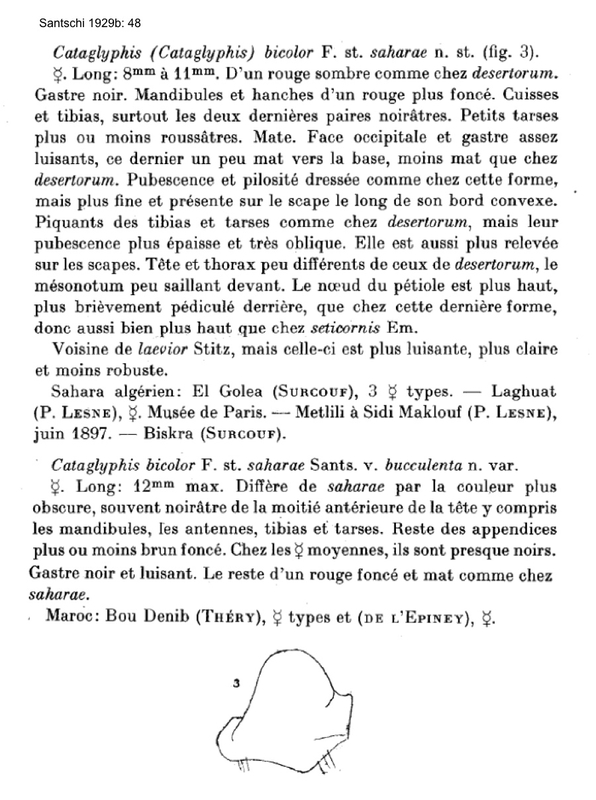 He (page 1477) refers to bicolor-group from on the beach in the tropics, citing the Ivory Coast, but later (page 1478) gave bicolor as bicoloured workers with appressed white to yellow pubescence on the hind tibiae. Under the setipes-complex, large workers (AL < 5 mm) he noted bicoloured with thick, bristle-like black pubescence on the hind tibiae; stating the distribution includes Ghana. See Cataglyphis bicolor and Cataglyphis oasium specimens. Karavaiev's (1912b) description of sudanicus is at . 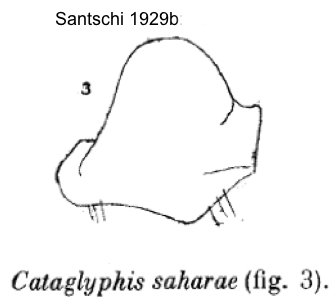 Santschi's (1929b: 46) description of Cataglyphis bicolor F. st. nodus n. var. oasium is at . The photomontage (right) is of a a full complement of workers from Burkino Faso, ;collector Alain Lenoir. Two colonies of C. sp (called thereafter C. sp BF) from Burkina Faso were collected in 2006 and 2007 in Burkina Faso near Bobo Dioulasso (11� 07.015 N; 4� 23.286 W, 460m asl - specimens in B. Taylor collection (2)). Photomontages of the polymorphism are shown on this link.